We have long advocated for the elimination of the 421-a tax abatement because it has been nothing but a giveaway to developers masquerading as a means of affordable housing production. This is why affordable housing advocates across the city celebrated when 421-a expired on January 15. Since its expiration, arguments about its possible revival are popping up more and more frequently, along with lamentations about its demise. How quickly we forget the many published analyses exposing the fact that even though the controversial tax abatement has created little affordable housing, it has cost New York City taxpayers up to $1 billion in lost tax revenue annually. Only about 1,350 affordable apartments were created over the previous four years of this wasteful program. That is fewer than 350 per year, and with a price tag of $833,000 per affordable apartment created. Instead of discussing benefits for rich developers, all attention should be on fixing the major loopholes in the rent regulation system that houses 2.5 million tenants in approximately 1 million units with no cost whatsoever to the taxpayer. One of the most egregious of these loopholes is the "eviction bonus," which allows enormous rent increases of up to 20 percent in rent-stabilized apartments upon vacancy. This may be the greatest threat to the affordability and retention of rent-regulated housing, which is the foundation of strong and diverse communities and the reason that tenants looking to move are faced with unaffordable rents in every neighborhood in this city. The eviction bonus affects tens of thousands of low- and middle-income tenants – far more than those benefiting from 421-a. Then there are "preferential" rents, the other much-used landlord tool for driving rents and pushing tenants out of rent-regulated apartments. An estimated 325,000 low-income families are vulnerable to unaffordable rent increases upon lease renewal because the preferential rent system affects 1,000 times as many families than those that benefit from new 421-a affordable units each year. 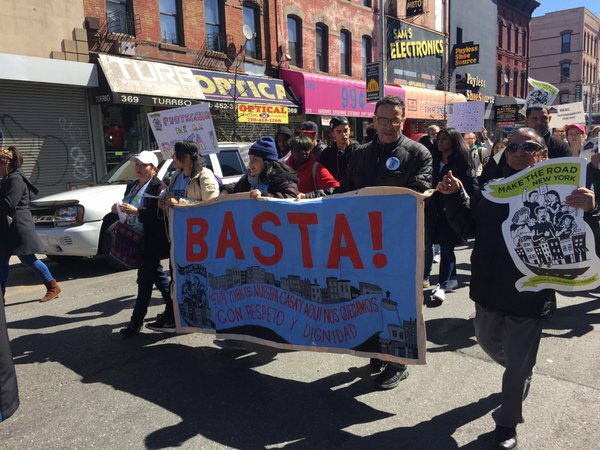 These were the reasons for a major rally of 300 community folks this week in the quickly gentrifying neighborhood of Bushwick, where Brooklyn residents described the many tactics used by landlords to evict rent-stabilized tenants in order to increase rents. The rent laws were renewed in June 2015, with nowhere near the reforms necessary to protect tenants in New York. Without strong rent regulations, tens of thousands of tenants will eventually be met with only two choices: end up in homeless shelters or leave the city altogether. Neither is acceptable. As the state moves beyond budget negotiations into legislative session, rent laws should become the focus of discussion, not the $1 billion 421-a developer giveaway. The millions of low-income tenants at risk of losing their homes and stable communities are more than enough reasons. Delsenia Glover is the campaign manager for the Alliance for Tenant Power. On Twitter @TenantPowerNY. Last week, New Yorkers learned that a bill creating a new Citywide Certificate of No Harassment program would be part of the city's new housing deal. The legislation, which will be finalized by a new task force before being adopted, will require landlords to get a certificate confirming that they have not harassed their tenants before demolishing or altering a building. 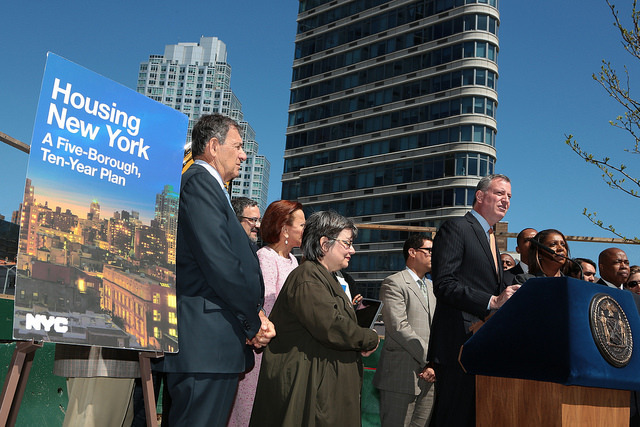 This provision of the housing deal is especially good news for tenants across the city. As real estate prices have skyrocketed and gentrification has spread, so too has rampant harassment by landlords. All too often, they try to get rid of working-class and low-income tenants, especially those in rent-regulated apartments, so they can renovate units and lease them at much higher prices. This pattern has displaced thousands of tenants and left all too many with nowhere to go. Take the case of María Elena Khochaiche, a retired, low-income renter who lived in her rent-regulated Bushwick apartment for 40 years. Recently, the value of her apartment rose quickly with the neighborhood's gentrification. Her landlord responded with greed: he tried to get rid of the rent-regulated tenants, including her, because he knew that he could make more with market-rate tenants. He began by taking them each to court. They had done nothing wrong, but the fear of frivolous lawsuits led several residents to simply give up and leave. Eventually, all the other tenants left, but María Elena had nowhere to go. She knew she'd never be able to afford another apartment in Bushwick. But that didn't stop the landlord. Instead of letting María Elena stay in peace, the landlord opted to stop making legally-required repairs to pressure her to leave. Broken windows stayed so she could not open them, the bathtub stayed backed up so she could not bathe, and a mouse infestation went unaddressed. For months, the lights in the hallways did not work. Seventy-five-year-old María Elena had to use the light from her cell phone just to make sure that she didn't fall while she struggled to reach her front door. María Elena followed the rules and filed a housing complaint, but her landlord took advantage of the process and filed numerous motions to bog down the case. Eventually, María Elena couldn't take it anymore. When the landlord offered her a buy-out to leave, she just couldn't fight on, even though she knew that taking it would mean not being able to stay in the community she loved. The decision troubled her, but María Elena was one of the "lucky" ones. Her neighbors were forced out without getting as much in return. María Elena's experiences are all too common for New York City tenants. Landlords harass tenants to try to get them out of affordable housing—often by using threats or legal action, or failing to make repairs that they need to make apartments livable—and then, once the tenants are gone, either renovate or build new market-rate units to rake in as much profit as possible. The result: many New Yorkers end up with nowhere to go. Without requiring landlords to obtain a Certificate of No Harassment, unscrupulous landlords will continue to use every trick in the book to cut corners and push tenants like María Elena out. But when landlords are required to get a Certificate of No Harassment before starting renovations or demolition, they will not be able to get away profiting from mistreating their tenants. And if they do, their mistreatment would come to light and subsequent construction or demolition would be blocked unless the landlord provided a "cure" of permanently affordable units. This "cure" of setting aside permanently affordable units will be critical for making sure no landlord can profit from harassment. And taking away the profit motive will provide a strong disincentive for harassing tenants in the first place. The Certificate of No Harassment legislation, once finalized and voted into law, will bring greater peace of mind to tenants like María Elena and be a substantial victory in the fight to hold abusive landlords accountable for harassing their tenants. Javier H. Valdés is the Co-Executive Director of Make the Road New York. Benjamin Dulchin is the Executive Director of the Association for Neighborhood Housing and Development. On Twitter: @MaketheRoadNY & @ANHDNYC. Mayor Bill de Blasio didn't need to see the Assembly and Senate one-house budgets to know where he stands with each chamber - Assembly Speaker Carl Heastie is a close ally of the mayor, his fellow New York City Democrat, while Senate Republicans hold a major grudge against de Blasio for leading a failed effort to boot them from the majority two years ago. Most Republican legislators, who control the Senate but not the Assembly, are also philosophically opposed to much of de Blasio's agenda. Still, the documents give de Blasio - himself in the midst of a city budget process that depends quite a bit on state decisions - more clarity as budget negotiations truly heat up in the capital. With the governor's executive budget out for two months, plus the newly passed one-house budgets, de Blasio now has an idea of how hard a fight he and his allies have to get what they want. The Legislature uses one-house budgets to set chamber priorities after analyzing the governor's spending plan, which is typically issued at the start of the year. The budgets are non-binding but used to send clear messages about majority conferences' top priorities before entering final negotiations with the governor. While there are a variety of city-specific issues at play, de Blasio has made it clear that he is supportive of Cuomo's push for both a minimum wage increase toward $15 per hour over the next several years and a paid family leave policy. These are two major agenda items for the governor, where Cuomo laregly has Democratic support but must negotiate deals with Republicans. With all three budgets out, Mayor de Blasio, city officials and residents are all taking note of where things stand on several other major issues. Assembly: Mayor de Blasio's allies in the Assembly support a seven-year extension of mayoral control, which would make expiration June 30, 2023. Such a distant date would remove the issue from the political equation for years to come and prevent Cuomo and Senate Republicans from holding it over de Blasio's head, even through a potential second term for the mayor. Senate: While addressing the chamber before the vote on its one-house budget on Monday, Majority Leader John Flanagan said that he didn't feel mayoral control was a budget issue. He indicated he expects to have relevant hearings later in the year where de Blasio will be asked to testify. When asked about attending hearings by Gotham Gazette de Blasio said on Monday that he had expected them and welcomes the chance to discuss mayoral control. He was quick to remind that he had already met with Flanagan and discussed the subject. "I've already sat down with him, obviously, and talked to him about this," de Blasio said on Monday at an unrelated press conference in Harlem, referring to the mayor's trip to Albany earlier this year. "I certainly made my case to him, it was a very good and respectful meeting. I think he heard my points. I'm not saying he agreed with all of them, but he heard them. He knows a lot about education, obviously, from his own work on the education committee in the Senate. And I will welcome a dialogue. I told him I will happily appear at a hearing any time." Cuomo: The governor's budget could cost the city nearly a billion dollars in funding through plans that would see the city assume increasing costs for Medicaid and funding for CUNY. The governor insists that the city can afford to take on a greater share of the costs of both city-state programs. Facing criticism from de Blasio, his allies, and budget watchdogs who warned the shifts would devastate the city's finances, Cuomo insisted his budgeting would simply foster a joint cost-saving exercise that in the end wouldn't cost the city anything. However, no adjustments were made to the plan in the governor's 30-day budget amendments, leaving the cost shifts as an expensive bargaining chip. While aides to de Blasio and Cuomo have been in conversation, there has been no evidence of progress in finding such efficiencies. Assembly: Assembly Democrats rejected both cost shifts, winning the praise of the mayor and education groups who have turned up lobbying efforts in recent weeks. Advocates say the cost shifts would devastate CUNY and make it much harder to provide higher education, especially to those who can't afford private school tuition. Senate: Both proposals remain in the Senate plan. Debate over the CUNY shifts took a curious turn on Monday as Republican Sen. Cathy Young, the chair of the finance committee, offered a new rationale for the CUNY proposal: the cost shift as a punishment for recent anti-Semitic incidents at CUNY and what some lawmakers see as an inefficient response to them. "In light of recent anti-Semitic events at CUNY campuses," reads the Senate's budget summary, "the Senate denies additional funding for CUNY senior schools until it is satisfied that the administration has developed a plan to guarantee the safety of students of all faiths. The Senate fully understands the importance of the City University System, and supports the full restoration of State support when this difficult and atrocious situation is adequately addressed." Democrats were taken aback by the rationale. "Everyone agrees that anti-Semitism is bad. But the way you fight it is not by hurting the students," said Sen. Toby Ann Stavisky of Queens. "This administration has been outspoken in ensuring that NYC continues to be a model for other cities in combating anti-Semitism," de Blasio said in a statement to Gotham Gazette. "Our institutions of higher education must be spaces where people of all faiths can thrive and feel safe, and CUNY must ensure that's the case. The best tool to combat hate is education - and we must be investing in it, not cutting it." Cuomo: The governor's budget includes a proposal to give the state final say over housing projects financed by federal tax-exempt bonds the state distributes. The Public Authorities Control Board, made up of one appointee each from the Governor and legislative leaders, would have the ability to veto individual affordable housing projects. Cuomo touted the plan as lending transparency to the process, but contractors, housing advocates, Mayor de Blasio, and others expressed significant worry it would lead to instability, uncertainty, and delay to badly-needed affordable housing projects. De Blasio appeared buoyed when asked about both chambers rejecting the plan. "I think in the democratic system that's a rather striking statement," the mayor told reporters on Monday afternoon. "We said from the beginning that we thought this would make it harder to create affordable housing, and would slow the process down. It's quite clear the Senate and the Assembly agree, and we appreciate their support and look forward to working with them, because we need to, in fact, speed up the supply of affordable housing, not slow it down." Cuomo: The governor's budget proposes the creation of "The New York State Design and Construction Corp." that would be given oversight of public construction projects worth over $50 million. The DCC would be a subsidiary of the state's Dormitory Authority and would be headed by three commissioners, all appointed by the governor. Budget watchdogs and legislators see the plan as a power grab designed to give the Governor say in major construction projects headed by independent agencies such as the MTA. Cuomo: The governor's plan technically provides $8.3 billion in funding for the MTA capital plan, per an earlier commitment Cuomo made in striking a deal with de Blasio over plugging a funding gap. However, the governor's budget only appropriates $1 billion for the MTA this year and puts off the rest of the funding until the MTA exhausts its current resources. Assembly: Rejecting Cuomo's condition that the MTA exhausts its current funding first, the Assembly plan appropriates the remaining $7.3 billion Cuomo's plan puts off. Senate: Accepting most of Cuomo's funding plan, the Senate requires the state to provide $3.5 billion in additional funding to the Department of Transportation Capital Plan. Cuomo: The governor's budget recommends $4.4 million in funding for the agency he credits with restoring 50,000 units to the affordable housing rolls. Assembly: Provides a $5.8 million appropriation for the unit. Senate: Denies funding for the unit. On Tuesday, the two houses of the Legislature convened a joint hearing to kick off the formal conference committee process whereby representatives of each house meet to hash out the differences in their plans. Leadership announced committee hearings on public protection, mental hygiene, higher education, general government, environment and housing, transportation, economic development, human services/labor, and education all to take place throughout the day on Wednesday. Cuomo, Heastie, and Flanagan are also expected to pick up their closed-door negotiations with the deadline for a final budget being April 1. When the state budget is decided, de Blasio will then have to weigh its impact on his budget negotiations with the City Council, with a final city budget due at the end of June. History is always a summary. It weaves together disparate threads of individual experiences, and some threads color the pattern more than others. The conventional narrative of New York City after the 1970s fiscal crisis emphasizes what mayors, police commissioners, developers and other powerful people did. But that's not the story. It's just one. 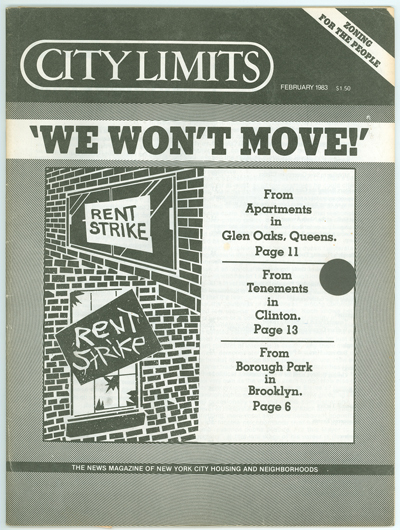 Since its founding 40 years ago this month, City Limits has told a different tale—one that has sometimes complemented, and other times contradicted the official version. That's because we talked about the New York seen by people like tenants, single mothers, strikers, prisoners, advocates, social workers, the homeless, the young and others who, when they strolled the traditional corridors of power, did so with a visitor's pass. As the excerpted stories below indicate, those New Yorkers had their own kind of power, and the city has been shaped by it. The stories are just snippets from our work over the past four decades. They reflect the history that City Limits saw and the New York it was founded to cover. For a look at those stories as City Limits hits its 40th anniversary, click here. "It's just surreal," said Jaron Benjamin a week after the conviction of former Assembly Speaker Sheldon Silver and on the day of closing arguments in the federal corruption case against former Senate Majority Leader Dean Skelos, knowing that those cases may have been bolstered by work he did years ago in the fight to strengthen the state's rent laws. In the span of less than a year Benjamin went from issuing a report exposing the connections among the real estate industry, holes in New York's campaign finance laws, and major legislation to seeing his work used by the Moreland Commission, only to see Gov. Andrew Cuomo unceremoniously shutter the anti-corruption panel. Then came the 2015 indictments of Silver and Skelos that many expected would scare Albany into enacting serious reform. But no transformative action has come, leaving Benjamin and other advocates to wonder what kind of impact their work actually had. "There is still part of me that thinks surely the people charged with enforcing the laws must have known this type of activity was going on," said Benjamin referring to the SIlver and Skelos cases, especially in terms of the involvement of the real estate industry. "Seeing all of this play out has made me question what is pay-for-play and what is business as usual. It's all been blurred, and being involved in Moreland and the 421-a fight made me question what exactly is unethical and what's illegal." In 2013 Benjamin was looking for a way to get people's attention. Then director of The Metropolitan Council on Housing, he needed a way to get regular New Yorkers interested in the backroom dealing that he saw as having continually allowed the real estate industry power to weaken rent laws every time they were up for renewal. "We knew we had to start preparing then for the 2015 rent law renewal and I said, 'I want an issue that kind of encapsulates all the talking points, captures the outrage of big real estate's buying power in Albany, something that would rile people up,'" Benjamin told Gotham Gazette. The report The Met Council released on June 5, 2013, focused on the influence of real estate moguls, like the now infamous Leonard Litwin, and their ability to flood politicians' campaign coffers with cash, subverting campaign finance limits by using the also infamous LLC loophole. Three years later, looking back, some advocates feel that the report was a turning point for Albany. But things didn't change the way Benjamin and his allies might have expected. After the report drew the interest of Moreland Commission staff in their investigation of legislative corruption that was later picked up by U.S. Attorney Preet Bharara, both former Assembly Speaker Sheldon Silver and former Majority Leader Dean Skelos were indicted on federal corruption charges brought by Bharara's office. The Met Council report and the federal charges exposed what many see as the undue influence of the real estate industry on New York State lawmakers and industry leaders' willingness to lavish lawmakers with cash legally and illegally to get what they want. And yet, with Silver convicted and the Skelos case before a jury, the state legislature and Gov. Cuomo have yet to act to change the system. Cuomo has been the biggest beneficiary of Glenwood Management's largesse, with his campaign accounts receiving over $1 million in donations over the years through many LLCs. Glenwood also gave half a million dollars to Cuomo's Committee to Save New York. In fact, even after Silver and Skelos were indicted and their relationships with Litwin's Glenwood Corp. revealed, Cuomo and new legislative leaders delivered a blow to tenant groups by enacting what many see as a real-estate-friendly renewal of the rent laws, deflecting pressure from advocates and Mayor Bill de Blasio. 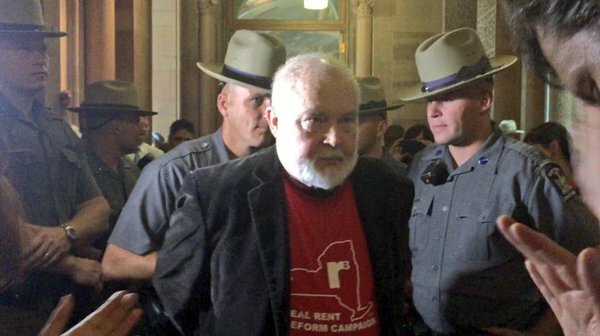 Michael McKee, treasurer of Tenants PAC, who has been involved in fighting for stronger rent laws in Albany for decades, said he hopes the convictions jolt Albany into action, but he is dubious that it will happen because the indictments weren't exactly shocking to him. "We knew Shelly had sold us out; he sold us out three times," McKee said of Silver, who was touted by many others as the protector of all things progressive in the state legislature. "We knew Skelos was owned by real estate lock, stock, and barrel. We didn't know the details, but it wasn't a surprise." Neither Benjamin nor McKee were surprised that Silver was receiving payments from Glenwood Management, or that members of Glenwood were helping Skelos' son land no-show jobs. The details were new to them, but the idea that legislative leadership and Glenwood were intimately connected was not at all revelatory. Neither was Skelos' declaration on a wiretapped phone call that he was weakening Senate Democrats by awarding Sen. Jeff Klein and the Independent Democratic Conference token power. Despite his doubts about active efforts at change, McKee acknowledges that the Albany reform conversation has changed since the Silver and Skelos indictments. The LLC loophole is now a major issue, with increasing pressure from good government groups, newspaper editorial boards and reform-minded lawmakers - like state Senator Daniel Squadron, who, along with colleagues and other allies, just released a report on the loophole. "It is very gratifying that people are paying attention now," said McKee (pictured below). "They ought to be properly shocked. It's just breathtaking, but some of this corruption is illegal and some of it is still perfectly legal." In June 2013 McKee and Benjamin weren't starry-eyed, but there was a feeling they might spur action in Albany. That month, Met Council released its report titled, "Tax Breaks For Millionaires: How the Campaign Finance System Failed New Yorkers and Helped Luxury Developers." That report examined how a small group of real estate interests used loopholes in the state's campaign finance law to funnel tremendous amounts of cash to politicians in exchange for support of the 421-a tax rebate program, which benefits developers of luxury apartment buildings. The hope of all hopes was that perhaps public outrage would move lawmakers to close the LLC loophole, "maybe level the playing field so we would have a shot against the real estate industry. At the time we knew that Leonard Litwin was a poster child for the LLC loophole," Benjamin told Gotham Gazette. Two years later Litwin's name would hang over Albany like a tropical depression, deals with Glenwood potential portals to the U.S. Attorney's office. The report made waves, gaining the attention of the editorial pages of The New York Times and New York Daily News, and garnering support of liberal activist groups across the state. Their hope for actual change was stoked when, in July of 2013, Cuomo empanelled The Moreland Commission to investigate public corruption. The commission held public hearings and appeared to be moving to a predetermined outcome. One day Benjamin was approached by commission staffers who wanted research information and addresses for real estate groups they planned to subpoena. "It really seemed like the Moreland staff took it seriously, but then the subpoenas got held back." The Governor's Office put the brakes on those subpoenas, which may be an ongoing topic of federal investigation itself. Benjamin's hopes were stoked again after U.S. Attorney Bharara took over the commission's files. "But there was no immediate action, so I thought 'OK, it was worth a try,'" Benjamin recalls. 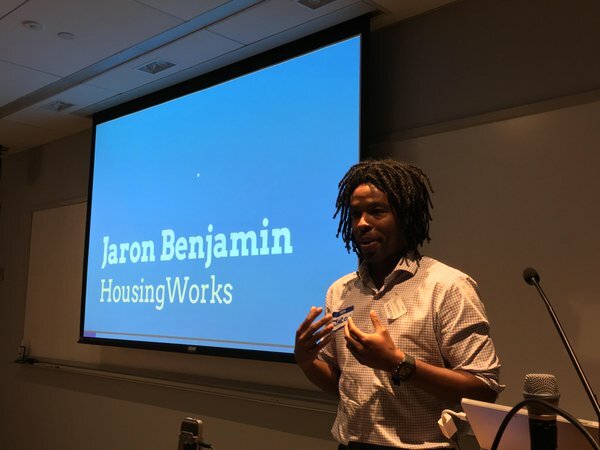 Now VP of community mobilization at Housing Works, Benjamin watched as the indictments rolled in - indictments that were spurred in part by the very issues he tried to highlight in 2013. It wasn't the change he expected. "I would never celebrate someone else's misfortune, but I am enormously proud of the work I did at the Council and I do feel some of that work did help clean up Albany." Benjamin (pictured above) says he sees indications that both new legislative leaders are more interested in listening to their members and willing to meet with groups that aren't the biggest donors. "It could be that they are both new, but it seems like they are both listening more and their doors are open," he said of Assembly Speaker Carl Heastie, a Democrat, and Senate Majority Leader John Flanagan, a Republican. McKee isn't holding his breath for sweeping legislative reforms spurred by the Silver conviction and Skelos trial. "I wish I could say the crap that came out about Shelly and Skelos is enough to get the governor and legislature to do something real on election reform and ethics, but left to their own devices they are going to pass some Mickey-Mouse bill that tinkers around the edges," he said. McKee hopes public outrage will move the politicians to enact real reforms. Years of frustration appear to have led McKee to conclude that tenants have one real shot left to influence policy in Albany, and that is the 2016 elections. He told Gotham Gazette that he is dropping all of his lobbying commitments to focus on recruiting and promoting Democratic Senate candidates for 2016, despite disappointments he has had with Democrats in both the Assembly and Senate. He believes the presidential election year offers as ripe an opportunity as Democrats will ever get to seize the Senate, and after that it will be too late for the next rent-law renewal. "I consider next year do-or-die. If we don't do it now we won't do it two years later." 2. Security Guards for Private Schools: On Monday, the City Council passed a controversial bill to provide public funding to private and religious schools to pay for security guards. $19.8 million will be spent to place at least one security guard at every private school in New York City with at least 300 students that wants one. 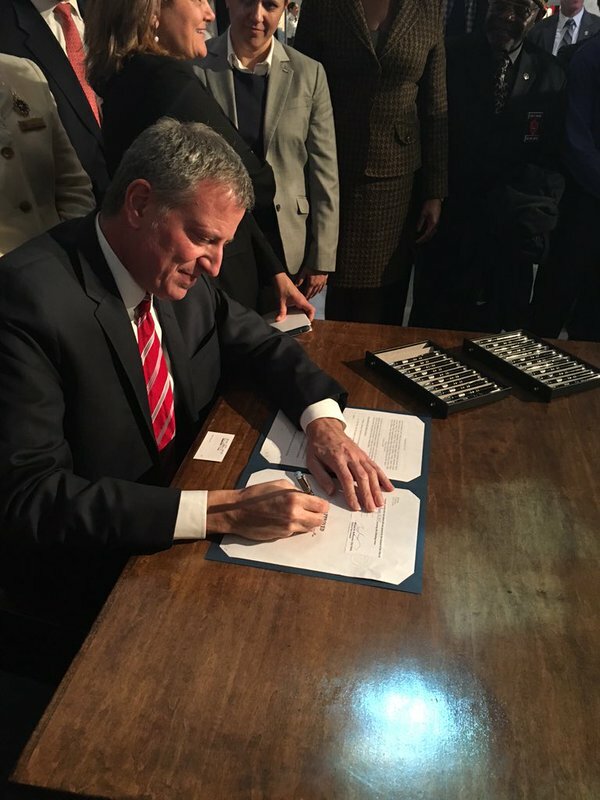 Mayor Bill de Blasio is expected to sign the bill into law. 3. Cuomo’s Common Core Overhaul: A task force created by Governor Andrew Cuomo issued a report Thursday which found that the state made a number of mistakes in its implementation of Common Core learning standards and recommended reducing the tendency to “teach to a test,” giving shorter tests, and not linking test results to teacher evaluations until the 2018-2019 school year. 5. Public Housing Problem: A New York City Department of Investigation report found that the NYPD’s “systematic failure” to communicate required information to the city’s public housing authority, NYCHA, is partially responsible for the disproportionately high crime rates that have plagued public housing projects. In response to the report, the NYPD will create an interactive database to improve information sharing about criminal activity in public housing with NYCHA officials. 4,000-plus inmates are currently in solitary confinement in New York, despite vows by officials to limit its use, the Daily News reports. 4,747 stop-and-frisks were recorded in New York City in July, August, and September - the lowest quarter since the numbers were first released in 2002, according to NYPD statistics. 93% decrease in the number of stop-and-frisks between 2011 and 2014, according to a report released by the New York Civil Liberties Union. 797 fatal drug overdoses were recorded by the city Health Department in 2014, the most since 2006, the New York Post reports. 20% increase in annual state spending for nonprofits is needed in order to fund a $15 per hour wage floor for nonprofit human services workers, according to a report released by the Federation of Protestant Welfare Agencies, Fiscal Policy Institute and the Human Services Council. 75% of incidents the FDNY responded to in 2014 were medical-related calls, and only 5% were fire-related, though a vast majority of the FDNY's resources are devoted to staffing fire units, according to a report from the Citizens Budget Commission. $12 million will be added to the city’s budget to increase job training programs for homeless individuals in the shelter system in 31 shelters across the 5 boroughs, the Daily News reports. 6,217,621 people rode the subways on October 29, 2015, according to the Metropolitan Transportation Authority - about 50,000 more than the previous record reached last year. It was a good week for supporters of raising the minimum wage, as a state appeals board upheld Governor Cuomo’s planned increase to a $15 per hour minimum wage for fast food workers, disputing arguments that certain factors weren’t adequately analyzed before making the decision to raise the wage. It was a bad week for Anthony Mangone, a former attorney whose cooperation aided in the conviction of three New York state senators, who was sentenced to 18 months behind bars this week after a judge said the “dirty lawyer” had committed crimes too serious to escape incarceration. Around this time 40 years ago, on December 9, 1975, President Gerald Ford signed a $2.3 billion seasonal loan authorization to prevent New York City from having to default. Around this time 74 years ago, on December 7, 1941, in the panic that ensued after the Japanese attacked Pearl Harbor, Japanese nationals living in New York were rounded up by FBI agents and held on Ellis Island. They were later transferred to internment camps for the remainder of the war. Around this time 22 years ago, on December 7, 1993, Colin Ferguson opened fire on a Long Island Rail Road train, killing six passengers and wounding 19 others. Days later, a New York Times editorial called for stronger gun control laws in response to the murders, pointing to the ease with which Ferguson obtained a handgun in California, which had one of the country's stricter gun laws at the time. Mayor de Blasio spoke with Errol Louis on NY1's Inside City Hall on Wednesday to discuss his first two years in office, and spoke about the city’s homelessness crisis, his affordable housing plan, and more. An in-depth report by ProPublica’s Marcelo Rochabrun and Cezary Podkul reveals that city and state regulators stood by as developer Two Trees Management disregarded laws requiring rent stabilization in exchange for the large property tax break it received. Politico New York’s Bill Hammond writes that Cuomo is making excuses about not doing anything to stop Albany’s ongoing culture of corruption, and argues that there are many glaring weaknesses left in New York’s anti-corruption laws. NOTE TO READERS: we hope you enjoy this new Gotham Gazette weekly feature - please share it if you do; on Twitter, use our handle @GothamGazette. Watch Sunday evening for our latest Week Ahead in New York Politics, which gives you a preview of key issues and events to be aware of for the week about to start. In the meantime, catch up on the latest original reporting from Gotham Gazette here. And have a great weekend! Tenant advocates disappointed by the rent laws deal reached by Gov. Andrew Cuomo and the Legislature at the end of session suddenly have a spark of hope, weeks after the backroom negotiations came to an end. Some are interpreting the wording of the new law to actually make it more difficult for landlords to deregulate apartments when rent reaches the established threshold, much to the chagrin of those property owners. Tenant advocates say the new language of the bill - which regulates about a million affordable apartments in New York City - mandates that landlords have rented an apartment under the $2,700 per month threshold before they can remove it from the rent control rolls. This is as opposed to being able to deregulate the unit once an allowable hike hits $2,700 per month even if the unit is between tenants. Advocates believe this will significantly extend the time under which apartments are rent controlled even if it does not stop their eventual expiration. Judith Goldiner, an attorney at the Legal Aid Society, said that since 1997, the language in the statute has been, "for any housing accommodation which is or becomes vacant on or after the effective date of the [1997 law] and before the effective date of the [2011 law] with a legal regulated rent of $2,000 or more a month." The threshold was raised to $2,500 when the rent laws were renewed in 2011. Goldiner said the language in the 2015 act can be captured as: "any housing accommodation that becomes vacant on or after the effective date of the rent act of 2015 where such legal regulated rent was $2,700 or more." They key being that the monthly rent was already $2,700 before an apartment is vacated, meaning that the rent threshold cannot be reached between tenants due to allowable vacancy and renovation bumps. The Rent Stabilization Association (RSA), a landlord group, is aware of the language and believes it to be a drafting mistake that the Legislature could address along with a host of other drafting errors in the "Big Ugly" that was rushed to a vote on June 25 after session went into week-long overtime. But, it is unclear if the Legislature has any interest in returning to deal with the language. Sources in the Assembly say the language in question was inserted intentionally and they would not consider altering it. Cuomo administration officials indicate they did not think the language was an issue. 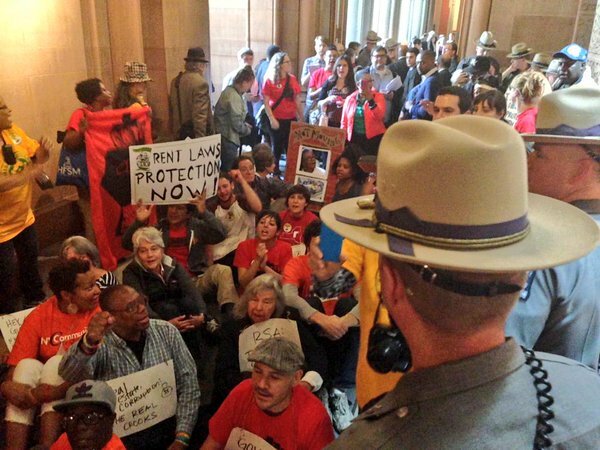 Tenant advocates wonder if Cuomo would dare alter the bill even if it was unintentional given that his allegiance to Democratic ideals has been under so much scrutiny of late. The governor recently felt backlash from the left after Senate Republicans touted a memorandum of understanding signed by his aide that appeared to agree to roll back a part of his signature gun-regulation SAFE Act. Not to mention attacks on Cuomo over elements seen as lacking (mayoral control of schools) or missing (minimum wage hike) from the final deal. "Our interpretation is a tenant has to be in place under that threshold before they could move to deregulate," said Goldiner of the Legal-Aid Society. Goldiner said this specific measure was something she and her colleagues advocated for at great lengths. "I don't think this was unintended," Goldiner told Gotham Gazette. "We were in many, many meetings with the Assembly telling them how this would stem the tide of deregulation. And in a bill where tenants got very little, I think this is fairly appropriate." Advocates still say that while the apartments would remain regulated, $2,700 per month is still a high rent and this tweak is not a game changer of any kind. Landlord groups are dismissing the language as a drafting mistake. "I think the fact of the matter is when you read the section of the law on legal regulated rent it has not changed at all," said Frank Ricci of the RSA. "The bill in its entirety did so much on so many things that there are drafting inconsistencies throughout the bill. It is not pristine and clean as it has been in past years." Lawyers for both sides are currently being consulted on the language and interested parties admit the debate could end up being settled in court. The dispute over the language adds a twist to an especially heated year for the real estate industry and tenant advocates, including many New York City-based legislators. Many lawmakers who represent parts of the city and advocates regard the changes made to the rent laws this year as minor tweaks that will only make it slightly more difficult for landlords to take apartments off the regulated rolls. The Legislature renewed the rent laws for four years and the law increases the threshold for vacancy deregulation and high-income deregulation from $2,500 to $2,700. Those thresholds will then be updated on January 1 of each year according to decisions by the city and suburban Rent Guidelines Boards. The amount landlords can increase monthly rent based on the improvements they make to apartments has also been reduced slightly and fines for tenant harassment have been increased. Sen. Adriano Espaillat, a Manhattan Democrat, called the changes "one inch forward," and added: "We saw some tougher penalties but there were no major victories, we are still going to lose thousands of affordable apartments over the next four years." Michael McKee of Tenants PAC agrees. He points to a study by Tom Waters of the Community Service Society that predicts the city alone stands to lose 87,500 rent regulated apartments given the $2,700 per month threshold. Frank Ricci, of the Rent Stabilization Association, said that the new laws will make it much harder for landlords to afford maintenance and repairs. "These changes are going to make it much more difficult to maintain buildings. The Major Capital Improvements changes are going to disincentivize owners from making major improvements or doing major work like fixing the boiler." "We've said for 22 years that raising the threshold is meaningless," said McKee. "It simply makes financial sense for landlords to spend the money [on repairs] to deregulate their apartments. The new laws do nothing to disincentivize them." However, Espaillat and McKee say that tenants were particularly organized this year and effective in putting pressure on Cuomo and the Legislature. Advocates barraged the governor at his offices and continued their protests after the deal was passed - at one point targeting Cuomo's home in Westchester. There may be no lull in the action as calls to strengthen the laws continue and the 2016 election year is just around the corner. On Wednesday, Brooklyn Borough President Eric Adams, a former state senator, will brief the media "about a new push to achieve some of the urgently needed protections not provided by the recently approved rent laws negotiated by Governor Andrew Cuomo and State Senate Republicans." Adams is also going to convene a meeting of state and local electeds and tenant advocates "to discuss plans moving forward." Legislators and tenant advocates say they think the recent campaign could continue and be used as a tool to help Democrats win control of the state Senate at which point they could revisit the rent laws even before they expire. "We we were on point on organizing, on messaging, on building a coalition," Espaillat told Gotham Gazette. "If we win the majority next year we could very well address affordability." Democrats, who traditionally do better in presidential years, hope in part to ride a Hillary Clinton wave. Ricci told Gotham Gazette that such action would create an unstable environment for landlords. "If you want a well-preserved housing stock in the city, you need consistency and predictability," said Ricci. "There is a lot of thought and planning that goes into improvements. If there is talk every year about tinkering it would create an unstable environment. In fact it would be shortsighted on the part of the Legislature to even talk about changes because it will stop people from making these large investments." 1. De Blasio Slams Cuomo, Leaves for Vacation: On Tuesday, June 30, Mayor de Blasio, First Lady Chirlane McCray, and children Chiara and Dante left for a vacation in the Southwestern and Western United States. They will be returning on Wednesday, July 8. Before leaving, de Blasio filmed an interview with NY1’s Errol Louis for Inside City Hall and then spoke with reporters in his City Hall office, in both instances heavily criticizing Governor Andrew Cuomo and expressing a great deal of frustration about the way the governor has acted toward the mayor and the policies that came out of Albany negotiations. 2. RGB Votes for a Rent Freeze: For the first time in its history the Rent Guidelines Board voted to freeze rents on about a million regulated apartments. On Monday, after four previous open meetings with public testimony, the Board voted 7-2 for freezing new or renewed one-year leases beginning October 1 while tenants signing two-year leases could pay up to a 2% increase. Tenants and their allies have celebrated the vote, which the mayor called "the right move" by board members he appoints. This comes on the heels of a deal to extend rent regulations in Albany that many tenants and their allies call inadequate. 3. NYPD Oversight Hearing: On Monday the City Council heard nine proposed NYPD-related bills, including the two that make up the “Right to Know Act.” The bills deal with police communication with civilians, officers’ use force, and more. “I wish to say respectfully, but firmly, that these are the purview of the police commissioner and the police department, and not of legislative control,” said Police Commissioner Bill Bratton at the hearing, expressing his opposition to the bills. The next night, key stakeholders met to discuss police accountability in an open forum. 4. Capping Uber: The City Council Committee on Transportation heard a controversial bill Tuesday that would require the city’s Taxi and Limousine Commission to conduct a study on how the taxi and for-hire industries affect traffic, air quality, noise, and public health. The bill could put a cap on the number of for-hire vehicles. On the day of the hearing Uber, the most prominent of non-taxi for-hire vehicles offered free rides to anyone using the Uberpool carpool service to go to a protest against the bill at City Hall. 5. FBI Investigating Upstate Prison: The FBI launched an investigation into Clinton Correctional Facility, the prison Richard Matt and David Sweat escaped from earlier this month, related to possible corruption, including drug trafficking. The FBI investigation is said to have been started around looking into how Matt and Sweat broke out of the prison, but has expanded. 13 Metro-North employees were brought into court Monday on charges that they had "cheated on the exams required to become a train conductor or locomotive engineer." It was a good week for Maria Torres-Springer, who has been the Commissioner of the Department of Small Business Services, and is becoming President of the city's Economic Development Corporation, or EDC. Appointed by Mayor de Blasio, Torres-Springer will be the first female EDC chief. It was bad week for old political friendship, as the feud between Mayor de Blasio and Governor Cuomo escalated, with de Blasio issuing scathing criticisms of Cuomo in the aftermath of the end of Albany’s legislative session. Mr. de Blasio declared that he has tried to work with Cuomo but has “been disappointed at every turn.” He also called the governor vindictive and said that he had lost his way in terms of his Democratic principles. Two years ago, on July 3, 2013, then-mayoral candidate Anthony Weiner gave a campaign speech outside of City Hall, "A Big Apple Declaration of Independence from Albany." Number one on his ten-point list: permanent mayoral control of city schools. This week in 1776, on July 4, the United States Declaration of Independence; 239 years ago. Crain's New York Business unveiled its Most Powerful Women 2015 list. Mid-June, it was a block in Washington Heights that was poised to be the next to close up shop. The landlord, Coltown Properties, looked to evict the mostly Latino-owned stores on the street, which included a barbershop, restaurant, and income tax service. The store proprietors faced the same issue as many other small business owners in New York — there was nothing they could do. “Collectively, the businesses on this block have been in operation for over 80 years,” local City Council Member Mark Levine said at a press conference on 162nd Street and Broadway. “At a time when unemployment rates in our neighborhood are disproportionately high, these businesses are vital to the economic livelihood of this area.” Levine’s office is partnering with Legal Aid Society to provide legal assistance to small businesses in his district. 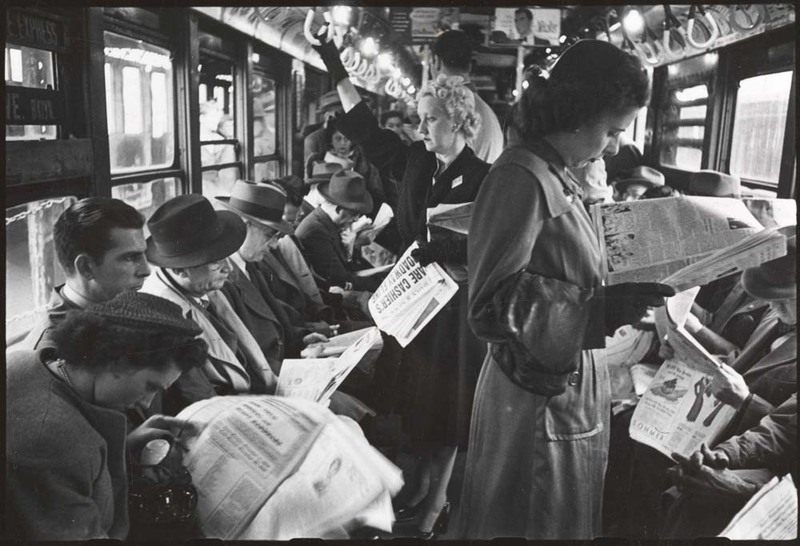 This is New York today, the plight of the city’s small businesses is grumpily accepted like a late train. It’s perceived by many New Yorkers as a part of the city grind, the dog-eat-dog, if-you-can-afford-it-here-you-can-afford-it-anywhere reality of a town teeming with opportunity, but becoming evermore competitive - and expensive. Echoing all too quietly in the halls of both city and state government, the average retail rent in Manhattan has risen 22 percent over the past decade, causing a sprawl of small businesses to relocate or simply close. It is a disease that’s spread to Brooklyn too. As news and debate over residential rent regulation dominated Albany and New York City over the past several months, what happens on a daily basis to small businesses throughout the city tends to fall by the wayside. Commercial tenants have far less protection against sudden rent increases than residents do, and now, that deficit is playing out in pockets of the city at an increasingly rapid pace. In comes another Chase, next to the new Duane Reade. Depending on who you ask, the reasons vary as to why elected officials in New York and Albany have acted — or, to some advocates, failed — on reforming commercial rent policy. As it stands, the only bill in the New York State government that pertains to commercial rent in New York City is the “Small Business Survival Act,” first proposed by Senator Tony Avella of Queens in 2013. It aims to level the playing field between tenant and landlord by mandating arbitration privileges to small businesses. Landlords must follow certain criteria when setting a lease, and the commercial tenant has more time in negotiations. “The current commercial rental market results in unjust, unreasonable, and oppressive leases for the payment of rent for commercial space in New York City,” the bill reads. As of this legislative session, it has not seen a vote. The more common small business bills that do exist are like the resources offered by the city and state’s economic development agencies: they seek to provide clarity with forms, regulations, and other bureaucratic nuances that come attached to opening and operating a small business in a tax- and rule-heavy state. The same situation stands in the Business Council, the most prominent lobby for businesses in Albany. Providing commercial tenants with some sort of leverage in lease negotiations did not make its 2015 ‘Top Ten Objectives’ list, or the webpage for its subdivision of small businesses. Rejecting a higher minimum wage did, though. “If there is ever to be any movement on this issue, folks have to organize,” McKee said, talking with Gotham Gazette while he was in the midst of yet another major push to influence tenant rent regulations being set by lawmakers in Albany and the city’s rent guidelines board. As many can attest, it is especially tough to compete against what is, without a doubt, the most powerful force in New York politics: real estate. This is a business community that spends millions every year on political campaigns; the contributions of one of its biggest entities, the Real Estate Board, made up a tenth of the entire state’s campaign money last election cycle. And that’s just one group. To James Parrott, the deputy director and chief economist of the Fiscal Policy Institute, a left-leaning think tank, that wealth of influence explains the radio silence both down- and up-state, among Democrats and Republicans, on an issue that directly threatens real estate hegemony. Reasoning seems to be that if small businesses had more protections against space-seeking developers, it would cut into the pace and profits of the city’s longstanding natural order. Landlords either want to charge more for commercial space or developers want tenants out so they can sell or demolish and build anew. This, of course, includes commercial tenant rights. Parrott makes a key point: in a state government where the recently former Speaker of the Assembly and Majority Leader of the State Senate are both indicted for crimes involving real estate’s influence, it’s hard to believe a bill called the Small Business Survival Act would even last a day. Not to mention the probe into the abrupt closing of the Moreland Commission by Governor Andrew Cuomo; an investigation that is specifically looking into tax breaks for huge developers. City government is not excluded, either, Parrott argues. The tale of the Small Business Jobs Survival Act (better known as the SBJSA) in the City Council is a long yet uneventful one. Basically, the bill — which, in structure, is very similar to its upstate counterpart — has been floating around the chambers of City Hall since 2008. (Last year, Gotham Gazette dove into its reintroduction.) It would let commercial tenants have the right to lease renewal ten years or more. If a landlord wants to raise rent, mediation with the tenant would be mandated, and, if the parties don’t come to an agreement, an arbitrator would make the final decision. In essence, it is a flexing of New York City’s municipal home rule, which allows the Council to bypass Albany and regulate commercial code on its own turf. Similar proposals have existed in the Council for decades now, but all have met the same fate: failure. No surprise, Parrott says: the power of real estate is as strong in the city as it is upstate, if not stronger. Also, past mayors and council speakers have strongly sided with that community, meaning any bill is unlikely to ever see a vote, and even if passed by Council, likely vetoed. But, to tenant advocates, this time around offers hope. Finally, they argue, a legislative body and a mayor progressive enough to actually take up the issue. At least on paper. “Historically, the deference to Albany has served as a smokescreen/distraction for elected city officials to validate their appalling inaction on issues that they, in all actuality, have complete control over,” Kirsten Theodos, a spokesperson for Take Back NYC, a grassroots advocacy group for tenants and subset of the larger group Save NYC, told Gotham Gazette. Right now, the SBJSA has 19 City Council sponsors in a 51-member boday. Seeing the bill heard at a committee hearing and then brought to a vote is unlikely, and would probably first require a number of additional sponors signing on (Council members can support a bill without co-sponsoring, but sponsorship levels show strength). To land those additional sponsors, Theodos hopes that situations like the eviction of businesses in Washington Heights will shed light on the issue. When asked if Speaker Melissa Mark-Viverito, who endorsed the bill before becoming speaker, would support the bill now, a spokesperson pointed to remarks made by Mark-Viverito to The Villager in late May. She did not provide an endorsement of the bill then, but mentioned an argument that has been repeatedly made by the real estate community in the past: that the SBJSA is illegal. Last year, in Gotham Gazette, the president of the Real Estate Board, Steven Spinola, called the bill an “unconstitutional intrusion” on property owners. A spokesperson for the Board told me this position hasn’t changed. Essentially, the board believes it is not in the Council’s jurisdiction to regulate commercial tenants. Home rule doesn’t apply here, they say. Theodos stresses that this is not true; SBJSA would target the negotiations process, she says, and not install commercial rent control. The legal counsel to the Small Business Congress, a coalition of tenant advocates, supported this argument last year, citing Supreme Court decisions that enable local autonomy. As a member of the City Council, Mayor Bill de Blasio supported the SBJSA, but he has remained relatively mum on the bill since entering his current office. For many advocates, the hope is that he’ll extend the drive that he has recently demonstrated around housing rent regulations in Albany to the parallel issue for small businesses. However, although he was elected on a ‘helping the little guy’ message and a promise to embrace them, small business owners and their allies also worry that his tendency to meet with representatives from the Real Estate Board and other commercial heavyweights threatens his adherence to their cause. Holding an office that naturally attracts real estate interests, Council Speaker Mark-Viverito has also met with REBNY heads. While neither de Blasio nor Mark-Viverito appears especially cozy with real estate titans, neither has pushed directly on the commerical rent issue either. That isn’t to say nothing has been done by the de Blasio administration to help small business owners since he took office in January of 2014, though. His office’s Department of Small Business Services (SBS) is spending upwards of $27 million to streamline and defuse the regulatory process and, with the Department of Consumer Affairs, made sure that fewer fines are handed out to small businesses that can barely afford rent. More importantly, SBS has rolled out initiatives aimed at providing pro bono legal services to small businesses in lease negotiations; a policy which will soon expand, SBS spokesperson Merideth Weber told Gotham Gazette. “We are working to roll out additional programs that span the range of supports we can provide including education, assistance, and tools that can help businesses avoid pitfalls in leases, and make the retail market more transparent,” Weber said in a statement. Still, tenant advocates argue that these measures dance around the main issue: that small businesses have no legal powers against immediate evictions or rent gouging. In a hyper-developing environment reaching further into several boroughs, small business owners are often defenseless. With a state government not inclined to act on commercial rent policy in New York City, and a city bill that, for now at least, is on the back burner of the Council agenda, the urgency stressed by owners and advocates doesn’t seem to be resonating here nor there. 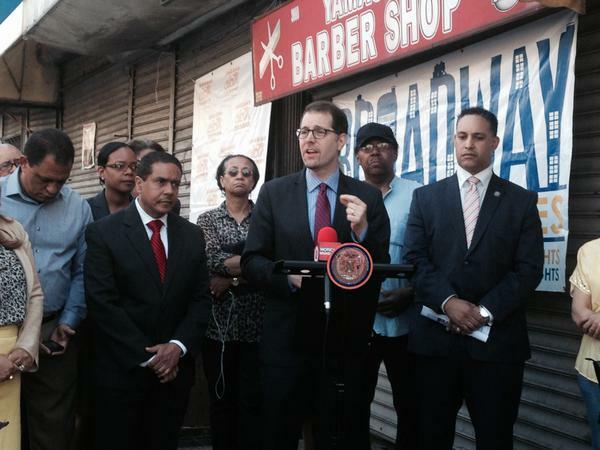 Council Member Mark Levine, who spoke out against the eviction of the small businesses on a block in Washington Heights, in his district, says that there are other options that can help stem the tide of closing small businesses. And these, he said, do not necessarily require either a dying bill or a dead government. “Albany is not acting in any domain, really,” he quickly noted. The city government, Levina argues, could set an example by not renting out its own real estate to chain stores. Also, zoning laws can be regulated in order to prevent chains and encourage small businesses — a policy that Columbia University has undertaken in Morningside Heights, Levine said. He added that the city should look into preventing developers who receive city subsidies from renting out to chains. One of the 19 sponsors of the SBJSA, Levine argues that the city needs to set out a structure in which commercial tenants can have enough time whereby they are properly notified of a lease change. He also referred to a bill recently introduced by Council Members Helen Rosenthal and Dan Garodnick that would raise the commercial rent tax exemption in Manhattan (below 96th Street) from $250,000 to $500,000 per year. As of now, the bill has 16 sponsors. John Surico is a freelance journalist. His reporting can be seen in The Wall Street Journal, The New York Times, The New York Daily News, The Village Voice, and elsewhere. He lives in Brooklyn. In the Democrat-controlled Assembly, it was 122-13; in the Republican-controlled Senate, 47-12. With those votes and a Governor Andrew Cuomo signature, a final policy package brought an underwhelming end to a tumultuous 2015 legislative session in New York's capital. 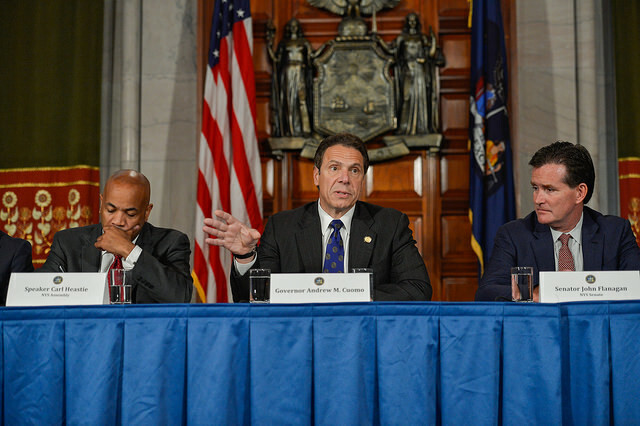 Look at the bill, which combines laws on a variety of disparate issues, and see it's headlined "relates to rent-control provisions," referencing what was to many the most important aspect of the deal reached by Governor Cuomo, Republican Senate Majority Leader John Flanagan, and Democratic Assembly Speaker Carl Heastie. This year's 'three men in a room' took a little extra time to get to "yes," with the 2015 'big ugly' passed through the Legislature a little over a week after the originally scheduled end of session. You can forgive Albany lawmakers for being a little tardy, though - as Governor Cuomo has said, it was no ordinary year in Albany. "This was a very difficult year," Cuomo said last Tuesday when announcing the framework of a deal. "There were extraordinary developments...It was almost unimaginable to have this kind of change in this period of time. You wound up with two new leaders." He was, of course, alluding to the fact that both Flanagan's and Heastie's predeccesors were arrested on corruption charges earlier this year. Along with an extension of rent regulations that mostly concern New York City tenants and their allies, the deal includes action briefly extending mayoral control of city schools and the 421-a real estate tax abatement program; providing property tax rebates; setting aside funding for nonpublic schools; and altering the cap on charter schools so more can open in New York City. Cuomo and the Legislature also struck deals on campus sexual conduct and nail salon regulation. While extensions were passed on major sunsetting items, the 2015 deal may be more notable for how much it did not include than for what it did. Cases in point: noting the absence of items he had promised action on, Cuomo announced two executive orders he would be issuing on criminal justice issues. Facing an uncooperative Senate, the governor had also already set things in motion to up the minimum wage on his own, with his Department of Labor convening a fast food worker wage board set to deliver recommendations soon. But on those issues some action is being taken - there is also a wide variety of policy seeing no movement through the end of session deal or Cuomo on his own, angering advocates behind pushes to enact paid family leave, the Gender Non-Discrimination Act, the DREAM Act, government ethics and campaign finance reform, and mixed martial arts (MMA), to name a few of the most-sought. New York will continue to be the only state that does not sanction MMA and one of only two that continues to try 16- and 17-year-olds as adults in the criminal justice system. Yet according to Cuomo, the end-of-session deal is a robust package, plenty good for New Yorkers, and further evidence that New York government is functional. Speaking at a press conference announcing a final agreement, Cuomo said, "I am personally very happy and very proud of this legislative package. I think that it is responsive to the problems that are pressing the state right now. I think that it is actually a very robust and extensive legislative package of reforms that goes a long way towards making this state a better state." The governor also praised Flanagan and Heastie. "These gentlemen were in a very difficult situation to step in as a new leader," Cuomo said, adding that it was "extraordinary" that the two could step into the legislative process in the middle of negotiations and ensure government keeps working. Flanagan seemed mostly pleased with the session's policy outcomes. Heastie less so. But, Heastie and many of his supporters have been quick to note that the deal appears to be the best the new speaker could do. He was fighting an uphill battle, many Democrats argue, against an obstinate Senate Republican conference and, in some cases, an unsympathetic Democratic governor. New York City Democrats - elected and otherwise - were largely disappointed, and many point a finger at Cuomo, who they say did not fight hard enough on key issues or for tenants. State Senator Adriano Espaillat, a Manhattan Democrat who voted against the end-of-session deal, said, "We are far from where we need to be to protect tenants...we need strong rent laws, not a slight improvement." City Comptroller Scott Stringer said similarly, "When it came to protecting tenants, Albany failed miserably," Stringer said Sunday on John Catsimatidis' radio show, according to the Daily News. "We have an affordable housing crisis," Stringer added, "But the rent stabilization deal didn't address those issues." The rent laws took center stage as Albany lawmakers let them briefly expire and the session puttered into overtime. But, the regulations were among many issues at play, some of which saw action. In looking at the outcomes of the 2015 legislative session - which some have called anemic or "the absolutely bare minimum" - we see the initial framework for next year's policy agenda. Rent Regulations: extended for four years, and strengthened slightly with an increase and indexing of the threshold by which units can be removed from the regulated rolls; an increase in civil harassment penalties where owners harass a tenant to obtain a vacancy; and an adjustment to the limits landlords can charge tenants to receive reimbursement for building improvements. Senate Republicans attempted to insert income verification measures, but they did not make the final deal. 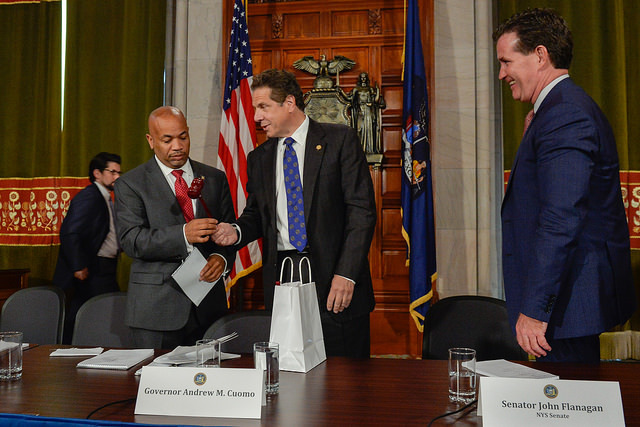 Of Assembly Speaker Heastie's push on rent regulations, Governor Cuomo said, "I believe the rent package that he has obtained is a major step forward. You have certain voices that would say rent regulations should just go away - I understand that, but that's not going to happen any time soon. But he has done an extraordinary job in crafting a program that addresses the entire spectrum of the problem." Reaction: the extension came as a relief to tenants and their allies, but is seen as largely inadequate, as the comments from Espaillat and Stringer indicate. City Council Member Jumaane Williams has said that "Governor Cuomo completely and thoroughly let New York City tenants down." A spokesperson for a coalition of pro-tenant groups, Real Affordability for All, said "This deal is very bad for tenants, good for corruption and a step further to eliminating the largest source of affordable housing in the state. The changes included to the laws are as insignificant as the reforms made in 2011, which led to the displacement of thousands of working class New Yorkers and to the high record number of families who ended up in city shelters. It completely ignores the affordable housing crisis." Activists say thousands of rent regulated apartments will be lost each year and they plan to continue to protest the deal. Taxes: the state property tax cap, limiting growth at two percent per year, is extended for an additional four years, and a new property tax credit, "$3.1 billion over four years in direct relief to struggling New York taxpayers," is included. In a statement, Senate Majority Leader Flanagan said, "We are taking action on long-held Republican priorities that reduce the property tax burden here in New York so that we can create jobs, grow businesses, and help taxpayers keep more of their hard-earned money." Reaction: the governor is largely praised for fiscal discipline when it comes to property tax increases, while the property tax cap and the new tax credit are seen as wins for middle class and wealthy homeowners. The Citizens Budget Commission, however, expresses concern about the tax credit, writing, "The legislative package passed in Albany last week rejected some misguided and expensive proposals, including a tax credit for benefactors of private schools. Unfortunately, other expensive proposals were included, adding to current and future state expenses without providing offsetting savings or revenues...By far the largest part is a new property tax relief rebate program, which will cost $1.3 billion annually when fully implemented." 421-a: "The legislation extends the 421-a program for six months, with a provision that allows representatives of labor and industry groups to reach a memorandum of understanding regarding wage protections for construction workers. If such an agreement is reached, the program will automatically be extended for four years," according to a release from the governor's office. A key piece of the deal is that affordable housing will be mandated as part of any development approved to receive the tax break, a significant change from the previous version, which included major exceptions. The deal also bans the so-called "poor door" setup that some developers enacted with separate entrances for market-rate tenants and affordable unit tenants. Reaction: 421-a was a source of conflict between Governor Cuomo and Mayor Bill de Blasio. The final plan - assuming that the two sides can come to a wage agreement - is very close to what de Blasio proposed, which he and his aides have pointed out, including through a convincing infographic. "Some real progress was made on 421-a. 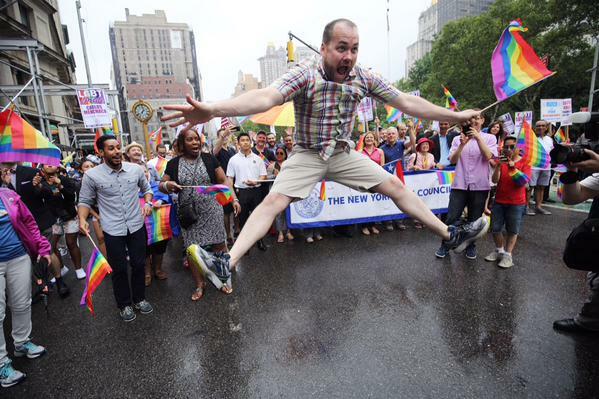 We were very proud of that fact," de Blasio said on Monday, according to The Observer. "We're going to have a lot more affordable housing than we would have otherwise, and taxpayers are going to get a much better deal, because any time we subsidize a building, there will be affordable housing as part of that." The deal does not include the so-called "mansion tax" de Blasio called for on sales of apartments over $1.75 million and used to fund affordable housing, which the mayor called "a mistake" and a "lost opportunity." The deal appears to work for just about all the key stakeholders, though the labor agreement that must be reached could halt the celebration, and even if it is worked out by the parties, the proof of this deal's success will be in the pudding that is real estate development and accompanying affordable housing built over the coming years. Education: there is $250 million to private schools "for the costs of performing State-mandated services," money which many say the schools are already owed; requirements for the "disclosure of state exam questions and answers" and other measures to improve standardized testing; a "one-year extension of mayoral control of the New York City school system"; and an "increase in the number of charter schools available to be issued in New York City to 50 and enhanced flexibility in teacher certification rules" for charter schools. Reaction: de Blasio and his allies had sought at least three years extension of mayoral control (de Blasio had originally pushed for it to be made permanent and the Assmebly had passed a seven-year extension); the one-year deal is seen as an insult to the mayor and, to some, revenge by Senate Republicans for de Blasio's 2014 efforts to swing the Senate to Democrats. It is unclear how much Governor Cuomo fought for a longer extension, though he had himself originally proposed three years early in 2015. "The outcome of the negotiations was the best that we could do," Cuomo said. Mayoral control will now be a focal point again in 2016 as de Blasio seeks another extension. Meanwhile, much of the rest of the deal appears to extend the governor's education reform agenda. Cuomo allies in the charter school sector praised the deal. "Today Albany leaders stepped up and delivered for parents and students who demanded more choice," said StudentsFirstNY Executive Director Jenny Sedlis. "Too many children are stuck in failing schools without options...Thankfully, Albany leaders understand that charter schools play a critical role in the delivery of free, public education in New York." Albany lawmakers also announced a deal enacting Cuomo's "Enough is Enough" campus sexual assault conduct policy across the state. "We have a bill on sexual assault on campuses that is the smartest and toughest bill in the United States," Cuomo said announcing the deal. "I think it's going to set a new national model for other states to follow." The governor is taking executive action on three issues, each of which will still be revisited in terms of legislation, likely in 2016. Governor Cuomo wanted legislation passed to raise the age of criminal responsibility, but Senate Republicans balked. "To me the single most important piece of 'raise the age' is getting the 16- and 17-year-olds out of state prisons and that's what I can do by executive order," Cuomo said last week. "We'll be creating facilities designed for those 16- and 17-year-olds that will be much more appropriate than a state prison," he said. Cuomo also announced that since he could not come to a deal with legislative leaders on a special prosecutor in cases where police officers kill unarmed civilians, he was appointing the attorney general as such for one year, and will hope to come to a legislative solution in 2016. The governor has pushed a further increase in the minimum wage, which is now $8.75 per hour and set to go to $9 at the end of the year. Unable to get Senate Republicans to bite, Cuomo announced he had instructed his Department of Labor to convene a wage board examining wages in the fast food industry. The wage board has held several public hearings and is set to announce its recommendations any day. Hopes are high that the board will "do the right thing and recommend a $15 wage for fast-food workers that will take effect as soon as possible," as a statement from Working Families Party State Director Bill Lipton read. Even if the board announces something less than $15 per hour, it is likely to push a significantly higher wage than $9. While Cuomo acts on his own regarding the minimum wage in the fast food industry, where 16- and 17-year olds are imprisoned, and how investigations into police killings of unarmed civilians are run, it is almost certain that the governor and others will want to see legislative action on the three issues come 2016. Ethics and Campaign Finance Reform: "I'm disappointed and, frankly, find it incomprehensible, that there were not further measures taken to reform the procedures in our state government and in our campaigns," Attorney General Eric Schneiderman said on Friday, according to The Observer. Schneiderman, who has put forth his own sweeping ethics reform package, said he wants to see a special legislative session before the scheduled January return of business to Albany. Good government groups, including Citizens Union, the Brennan Center, and NYPIRG, released a statement saying, "New York's leading civic organizations today decried Albany's continuing failure to fully address the ceaseless ethics problems head-on during the 2015 legislative session. The groups called on Governor Cuomo and the state's legislative leaders to convene a special session to tackle ethics reforms before the end of the calendar year." Among the reforms the good government groups and Schneiderman want to see are limits on legislators' outside income and the closing of the infamous LLC loophole, which allows virtually unlimited campaign donations. The Gender Non-Discrimination Act: The State Assembly has passed GENDA eight times, but the legislation, which, according to the Empire State Pride Agenda, "would update the state's anti-discrimination protections to cover transgender New Yorkers," has stalled in the Senate. The Pride Agenda released a statement saying that with the end of "a deplorably unproductive legislative session," the Senate has left transgender New Yorkers at continued risk "to the vicious discrimination that haunts countless trans lives." The Pride Agenda and allies also want to see action banning "conversion therapy" on minors in New York, which has also passed the Assembly. Paid Family Leave: It's an issue gaining more and more traction nationally, but New Yorkers are looking to push paid family leave at the state level in the absene of federal policy. Reacting to a lack of movement before the end of the 2015 session, the New York Paid Family Leave Insurance campaign issued a statement, saying, "It now appears that New York families will have to wait yet another year for paid family leave. Meanwhile, thousands of workers upstate and down are still forced to choose between caring for their loved ones and their families' economic security...While employers and employees in California, Rhode Island, and even next door in New Jersey continue to reap the benefits of this overdue policy, New York is still woefully behind." Advocates cite The Paid Family Leave Insurance Act, which passed the Assembly in March and "would provide up to 12 weeks of paid leave to bond with a new child, care for a seriously ill family member, and deal with issues that arise when a family member is called to active military service." Business owners and their allies continue to express reservations about any additional mandates placed on owners, both in terms of monetary cost and productivity. Many insist that New York should not take any further action to make the state more unfriendly toward business. Well before the end-of-session deal was reached, it was clear that little beyond the basics would be done. Those behind the issues above, plus the DREAM Act, a farm workers bill of rights, the abortion plank of the Women's Equality Agenda, MMA, and other pieces of legislation watched the final negotiations in disappointment, and beginning to think about influencing the start of business next year. In most instances, it is Democrats left wanting more. When the final deal was announced on Thursday, Assembly Speaker Heastie spoke of coming to terms with reality. "You could always want better," he said. "This is a bicameral Legislature and the Republicans in the Senate have their own vision on what they'd like to see and you do the best you can and try to compromise...We would have loved to have done more."